MIDI Memo Recorder is a simple application that records and plays any MIDI data. Free at the Apple App Store, MIDI Memo Recorder features a streamlined interface that makes it easy to store, find and recall all your synth sounds, POD® patches, inspirations, and more. Turn your Apple® iOS device into a full music production studio! MIDI Mobilizer™ and MIDI Mobilizer™ II are portable MIDI interfaces that connect all your modern and classic and MIDI gear to your Apple® iPod touch®, iPhone® or iPad®. MIDI Mobilizer interfaces let you make music any time, any place. With just a MIDI instrument and your Apple iOS device you can record pro-sounding tracks, capture song ideas or simply play with any of the incredible synths, samplers, sequencers, control surfaces and more available on the App StoreSM. The original portable iOS MIDI system. 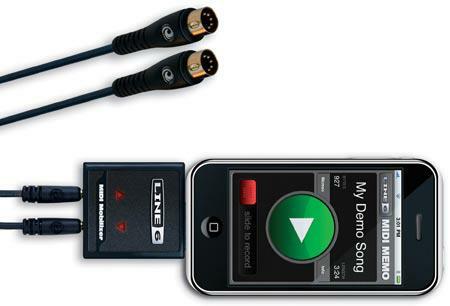 MIDI Mobilizer™ connects your MIDI gear to your Apple® iPod touch®, iPhone® or iPad® so you can play, record and backup MIDI information any time, any place. The original MIDI interface for iPhone, iPad, and iPod touch. MIDI Mobilizer connects to your Apple iPod touch, iPhone or iPad so you can play, record and backup MIDI information any time, any place. Easily backup and transfer all your MIDI parameters to and from Line 6 gear and all classic and modern MIDI equipment.